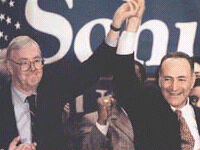 Sen. Patrick Moynihan congratulates Sen.-elect Charles Schumer Hours before the polls closed on Tuesday, officials at the Human Rights Campaign were already on the phone. They were calling New York gay leaders in an effort to repair the rift in the community that had developed when the national political group endorsed Republican U.S. Sen. Alfonse D'Amato's re- election campaign. By mid-afternoon, exit polls were showing that D'Amato had lost to U.S. Rep. Charles Schumer. Executive Director Elizabeth Birch put in a call to New York gay activist Jeff Soref, who threw a $500-a-plate fundraiser for Schumer last week, to congratulate him on the candidate's decisive victory. And HRC Political Director Winnie Stachelberg phoned Matt Foreman, head of Empire State Pride Agenda, which endorsed Schumer, saying that she hopes the two organizations could "work together" in the future. HRC officials this week tried to put the best possible spin on the election, saying that it was a "win-win situation" for gays because they had two good candidates to choose from. But, to some extent, it was a losing proposition for HRC, which suffered a loss of credibility with much of New York's gay community, which threw its support solidly behind Schumer. It's too early too tell what the long-term effects of the endorsement will be, HRC officials said, but, in the short run, the organization has lost a "significant" number of members. "We've lost members in New York, that's true," Stachelberg told the Blade the day after D'Amato's defeat. "It's too early to tell what this means as far as our relationship with New York's lesbian and gay community is concerned. I do know that more people do not support our decision than support it. I don't think that this will change." Stachelberg said HRC is already working to "mend our fences" with New York's gay leaders. But many of these leaders, angered by what they call the "arrogance" of a national group that seemed to try to force D'Amato on an unwilling community, said HRC will have trouble drumming up support among New Yorkers any time soon. They disagree, however, about what HRC should do next. Some say the organization should lay low to see if the controversy blows over, while others say it should actively court the community. Still others, barely containing their anger, say the organization should just pack up shop because it will never gain much support in New York's gay community. HRC put their money on D'Amato, saying he supported equal rights for gays and lesbians. "The Schumer victory should be a wake-up call to HRC," said Jeff Tooke, president of the New York Federation of Gay and Lesbian Democratic Clubs. "Whether they heed it or not is a different story. There is an opportunity now, that HRC can either take advantage of or not, to begin working with folks in New York. But on the flip side, I'm not exactly sure that folks here are interested in working with them. I don't think most people are interested in building a new relationship with HRC. Frankly, I think they've had enough." HRC acknowledged it has other fences to mend as well, such as with longtime Democratic supporters in Congress who felt the organization shunned a candidate with a longer and stronger record on gay issues. Stachelberg said HRC sent out letters to all its congressional supporters explaining the reasons behind the D'Amato endorsement. But Stachelberg also said she has received phone calls from Republican members of Congress saying they see the endorsement as a sign that the organization is truly bipartisan and will be more likely to lend it their support in the future. HRC must also patch its relationship with the White House, which strongly discouraged HRC from endorsing D'Amato and sent out the president, vice president, and first lady to stump for Schumer. Hillary Rodham Clinton spoke at a fundraiser sponsored by a gay group — a first for her — that netted the candidate $200,000 in the week before the election. One person most activists said is not likely to hold the endorsement against HRC is Schumer himself. The senator-elect has a long history of working closely with HRC, activists said, and is not likely to turn his back on the organization. Schumer, on the eve of the election, told the Blade that he "will continue to work with HRC on issues that are important to us." Despite the HRC endorsement, gay voters turned out to be solidly behind Schumer. A pre-election telephone poll commissioned by the Blade and conducted by the independent Mason-Dixon Political/Media Research firm on Oct. 26-28 showed that 67 percent of voters who identified themselves as gay favored Schumer. That was slightly down from the 74 percent that supported Schumer in a Mason-Dixon poll conducted before the HRC endorsement was announced. Experts said the difference could have been meant the HRC endorsement had some effect, but they pointed out that the difference was small and well within the poll's margin of error. Many activists said this week that, rather than drumming up gay support for D'Amato, HRC actually brought more votes for Schumer. "Chuck Schumer's victory clearly shows that HRC is out of touch with the gay and lesbian community in New York," said Wayne Mahlke, president of the Lesbian and Gay Democratic Club of Queens. "It also showed that we weren't going to be pushed into listening to them. We knew Al D'Amato for who he truly was." Kevin Finnegan, president of Gay and Lesbian Independent Democrats in Manhattan, said gay voters were clearly angered by the endorsement. He pointed out that his group and others were able to mobilize dozens of volunteers for the Schumer campaign. "Their endorsement backfired because it galvanized local activists in a way I have never seen them do for a non-gay candidate," Finnegan said. "We had more people on the phones here pushing for Schumer than we've ever had in any other race." But Finnegan said the endorsement also resonated outside the gay community. "At the same time, I think that HRC probably hurt Schumer outside the gay community because they gave D'Amato some legitimacy to his claim of being a moderate," said Finnegan. "For that, I am resentful." And it wasn't just D'Amato's stance on gay issues that made the difference. Many activists said D'Amato's stance on other issues — like abortion rights — turned many gays off. "What really energized the community wasn't that D'Amato was bad on gay issues, but that he was bad on so many other things," said Sterling Zinsmeyer, president of the Stonewall Democratic Club. "He's done some O.K. things on the gay agenda. What really motivated a lot of people were broader issues, like his stance against a woman's right to choose." Matt Foreman ESPA's Matt Foreman said he heard a lot of resentment over the fact that HRC calls itself a pro-choice organization, yet endorsed an anti-choice candidate. "One thing I heard over and over again was issues of choice," said Foreman. "A lot of lesbians I spoke with, and a lot of gay men, told me that they felt betrayed by HRC for not including choice in its endorsement criteria." 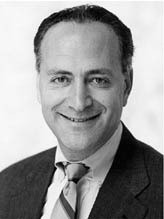 Most of New York's gay political groups threw their support behind Schumer in the general election after snubbing him in the primary because of his vote for the anti-gay Defense of Marriage Act. Officials at these groups admitted that they still had problems with Schumer's voting record but said he was still head and shoulders above D'Amato. Even HRC's own New York Steering Committee, a body charged with building up the group's membership in the state, was against a D'Amato endorsement. 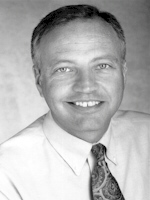 Tim Smith, co-chair of the steering committee, said that he and others members strongly urged HRC's board of directors not to endorse D'Amato. "It's a painful, touchy, hurtful thing for New York gays," said Smith. "A lot of us have difficulty with the board's decision. For those of us who have lived with Al D'Amato for 18 years, strategic benefits of the endorsement were beyond our grasp." Smith's co-chair, Joanne Melia, acknowledged that HRC still "has a lot of explaining to do" to New Yorkers about its strategy. At a meeting of the steering committee on Wednesday night, about 25 angry activists packed a conference room at the Lesbian and Gay Community Services Center to voice their opposition to the endorsement and demand an explanation. Stachelberg said strategy was the whole point of the endorsement. She said that the HRC's endorsement process is intended to reward incumbents with good records on gay issues. That's why HRC chose to endorse D'Amato, who earned a 75 percent approval rating from the organization in the last session, over Schumer, who earned an 85 percent approval rating. "The message that I hope anyone who heard about the endorsement got was that HRC is a bipartisan organization," said Stachelberg. "The message to people on Capitol Hill that we work with on a daily basis is that support for issues important to the community can earn an endorsement from HRC." Political observers said HRC was able to get this message across. "Their strategy was to send a message to the Senate majority that they are prepared to do business," said Kenneth Sherrill, chair of the political science department at Hunter College. "They were saying that, if Republicans will support them, they'll return the favor. Like any good professional organization, they reward their friends and punish their enemies." But Sherrill and other observers said that, while HRC proved that it is bipartisan, it also proved that it can't deliver votes. "It appears that they are now bipartisan, because they endorsed D'Amato," said Bob Bailey, associate professor of public policy at Rutgers University. "But on the other side of the coin, it appears that nobody in the gay community listens to them." HRC board member Andrew Tobias — a Schumer supporter who said he believes that HRC's D'Amato endorsement was "the right thing to do" — said that he and others knew that they wouldn't sway New York voters. "Did anyone really think that this endorsement would generate a lot votes for D'Amato, or that we expected that it would?" Tobias asked. "If HRC had the power to decide who would be the next senator, it would have been a much more difficult decision." The point, he said, was to reward an incumbent who had improved his stance on gay issues over the years. "It was a complicated situation," Tobias said. "The HRC board spent many, many hours talking before we made this difficult decision. To many people, an idiot could have seen what to do. But it really was the right decision. It makes sense to acknowledge when our community's traditional enemies demonstrate they have come around. It's really important to allow people to change their minds." But gay leaders said what HRC forgot was the voters in New York, and they weren't about to change their minds about D'Amato. Longtime activist Soref, who helped to organize the first fundraising dinners in New York for HRC, said the D'Amato endorsement would have repercussions both here and across the country. "It has the potential to scare state organizations all over the country," said Soref. "They all saw HRC ride roughshod over what the people in New York felt. They clearly were trying to force their decision on local groups." Soref said HRC needs to move quickly to show it is willing to work with local groups. "I know, and everyone else knows, that donors from across the country are going to cancel their contributions," he said. "The endorsement makes them look out of touch, quite frankly. It's a crisis, and they need to deal with it." Activists said HRC should add more input from local communities to its endorsement process. "They need to look to local groups for guidance on what candidates to back," said Finnegan. "Otherwise they'll perish. We don't need arrogant, inside-the- beltway organizations speaking for us." HRC's Stachelberg said the organization has steering committees to give local input. "We sought input throughout steering committee in New York," said Stachelberg. "We had numerous discussions with them, as we have with other steering committees on all of the other races we were involved in." But many activists doubted that even this would help convince New Yorkers that they should trust HRC. "I'm not sure what they are going to have to do to win back gay New Yorkers, since they have clearly alienated themselves from a majority of them," said Mahlke of Queens. "It will be a long time before they can recover."